What does the new “helpful flags” field in the profile page count? Recently the flag weight field was scrapped from the profile page, and replaced by a “helpful flags” field. I would like a clarification about how this new system works. (a) My current “helpful flags” count is 20, and I presume that this is because 2 of my comment flags have been deemed helpful. Is this interpretation correct? (b) Does this mean that flagging posts will not contribute to this count? Edit: I removed the feature request from this post and am posting it as a separate post. Apologies for the inconvenience. *This is private information, but I am posting it anyway in order to make the question concrete. 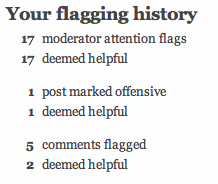 17 helpful mod attention flags + 1 post marked offensive + 2 helpful comment flags = 20 helpful flags. Of course, in retrospect, this is more natural than what I wrote in the post, but I am not sure why it didn't strike me until now. Perhaps I was deceived by the round figure of 20 (which I assumed was related to the 2 comment flags). I figured this out because today I had successfully flagged two more posts and my helpful flag count has increased to 22. Does Profile Views count my visits too? What Happened to Helpful Flags Counter on User Page? Why does my math se profile link show the Activity page and not the Profile page as default? What does the review count number mean?